held on selected public areas to provide additional hunting opportunities for Ohio’s hunting enthusiasts. status of their application and, if selected, print their controlled hunt permit. hunters, can be found at wildohio.com. s bird hunting seasons for mourning dove, Canada goose, rail, moorhen and snipe. increased for all migratory game bird species. hunting hours will be noon to sunset. Controlled dove hunts will also be offered at St. Marys Fish Hatchery on Sept. 1-2, 7, 14 and 21. Youths 17-years-old and younger will be given priority on Sept. 1-2. Opening day drawings for all of these hunts will take place at noon on Saturday, Aug. 24, at the respective public area headquarters. these hunts should be directed to the ODNR Division of Wildlife’s District Five office at 937-372-9261. 15 birds after the second day. The Mercer Canada Goose Zone will be open during the early Canada goose season. The early teal hunting season is Sept. 7-22 with a daily bag limit of six birds and possession limit of 18 after the second day. a daily bag limit of three. stamps are available online at the Wild Ohio Customer Center. Federal duck stamps are available at duckstamp.com. woodcock. Only nontoxic shot may be used to hunt waterfowl, rails, moorhens and snipe. Hunting hours are sunrise to sunset. The only exceptions will be on wildlife areas that have specially posted hunting times for doves. ODNR Division of Wildlife district offices or by calling 800-WILDLIFE. meeting on Wednesday, Aug. 21, according to the Ohio Department of Natural Resources (ODNR). hunting information, including zone maps. • Duck hunting season in the Lake Erie Marsh Zone is Oct. 12-27 and Nov. 9 - Dec. 22. • Duck hunting season in the North Zone is Oct. 19 - Nov. 3 and Nov. 30 - Jan. 12, 2014. • Duck hunting season in the South Zone is Oct. 19 - Nov. 3 and Dec. 14 - Jan. 26, 2014.
times the daily bag limit. 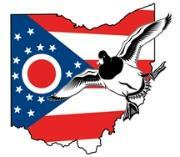 • Goose hunting in the Lake Erie Canada Goose Zone is Oct. 12-27 and Nov. 9 - Jan. 9, 2014. • Goose hunting in the North Zone is Oct. 19 - Nov. 3 and Nov. 30 - Jan. 30, 2014. • Goose hunting in the South Zone is Oct. 19 - Nov. 3 and Nov. 30 - Jan. 30, 2014.
established during the regular season apply. North and South Zones whenever they are open to duck hunting. completed, hunters will be provided a certification number to write on their Ohio hunting license. license agent outlets by late September. ODNR ensures a balance between wise use and protection of our natural resources for the benefit of all. Visit the ODNR website at ohiodnr.